IP Address – ip address of your JMM Server, if you use both Kodi and JMM Server on same machine use 127.0.0.1 (this is same IP you set in JMM Desktop to connect to JMM Server). Port – port number that JMM Server is running on (default is 8111). Query timeout (s) – number which represent seconds that will be max time to wait for respond from JMM Server. On very slow environments or very big collection this should be increased. User ID – number that represent your user in JMM Server (defaults are 1 (Default) and 2 (Family Friendly). This value is validated so you should get error if you use non existing value. Language – string that represents well known country codes. If series name is available in language you input here there will be use localized title of that series. 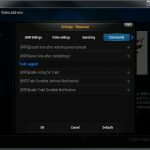 Show -continue- – continue is virtual item on episode list that will take you to first not watched episode on episode list. This is useful when you are watching big series’ like Naruto, One Piece, Gintama, etc. Results Max Limit – this value cut the number of results when using search to speed things up. If you use search frequently and always hit the 20 item limit fell free to increase this value. Hide AniDB helper or otherwise useless tags – meta tags, …to be deleted, etc. Spam the Log with info (only enable if told to) – this is for debugging purpose only. 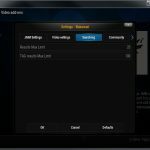 This will increase your kodi.log file size by a lot.